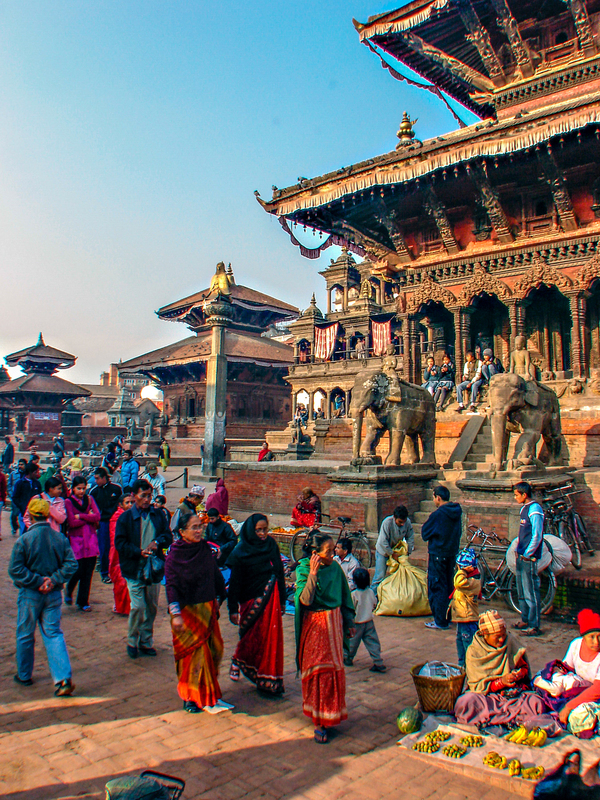 Nepal’s Kathmandu valley does not lack for dazzling religious and royal palace architecture. 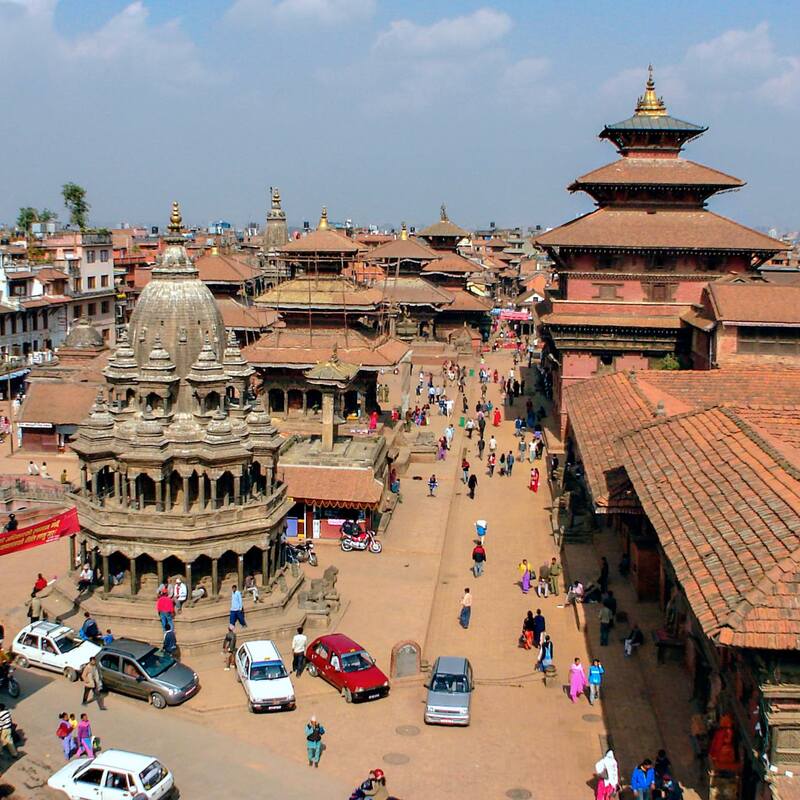 The map below shows some of the seven sites that have made the UNESCO World Heritage list for their enduring cultural value – Swayambhunath, the Boudha Stupa, Pashupatinath Temple, Durbar Square in Kathmandu itself, and a little to the south, Patan (aka known as Lalitpur). 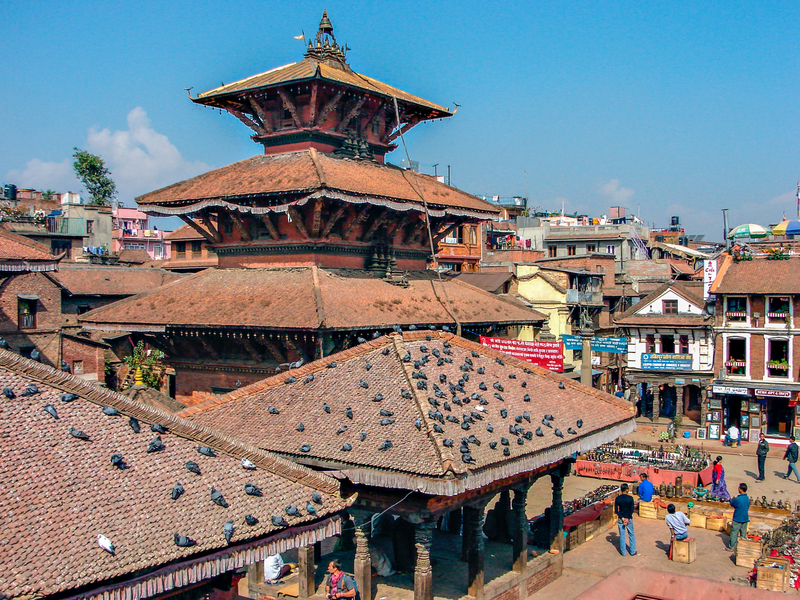 I set off early one morning on a four-kilometer walk from the Thamel district of Kathmandu to see Patan’s Durbar Square and its collection of buildings dating back to the 1600’s when it was the capital of one of the three kingdoms which controlled the valley. 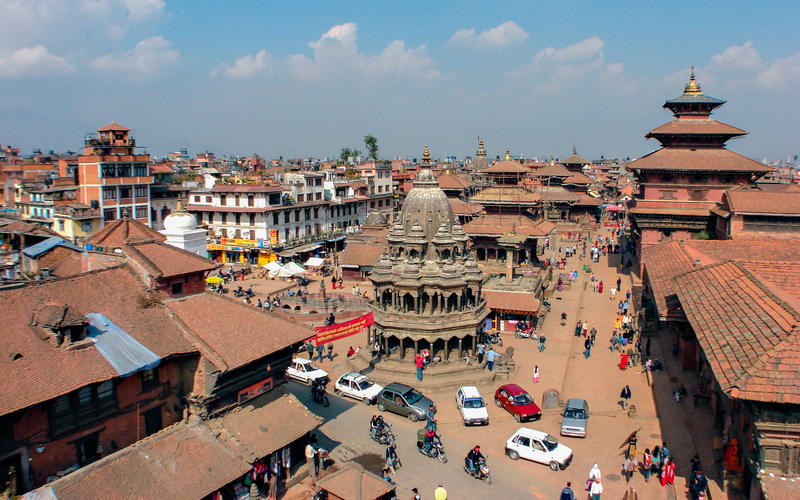 These days Kathmandu has expanded to such an extent that urban sprawl has all but swallowed up Patan. Only the Bagmati River creates a sense of separation from Kathmandu on the north side. Given how bad the pollution in the valley has gotten since I was there last, I’ll not be walking on my next visit in April of 2018! A fifteen-minute tuk-tuk ride will get me there without subjecting my lungs to an hour of filtering the deadly smog. 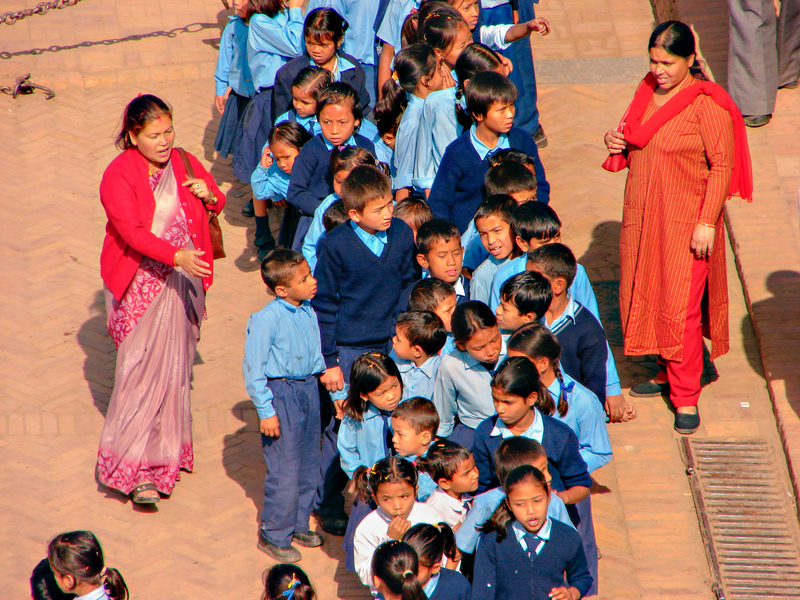 Since my first visit in 1996 Kathmandu has become one of the world’s most polluted cities! Part of the problem is the massive increase in population. In the past twenty years, it has more than doubled to 1.3 million. Add to that the exhaust of twice as many poorly maintained vehicles and the burning of coal and wood in the brick kilns. (See here for how Kathmandu ranks globally in 2017.) I plan on arriving with a mask – maybe a half-dozen of the cheap 3M disposables – to eliminate breathing in most of the harmful particulates during my stay in the valley after my three-week Mustang trek with the highlight being the crossing of Saribung La. There is a 1000 rupee foreign visitors’ entrance fee to the square. 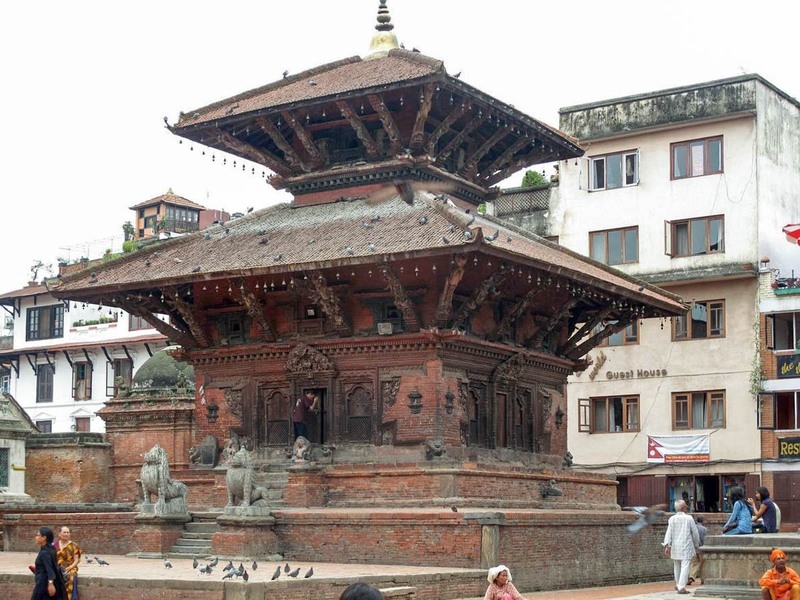 I could feel the different vibe as I walked around; it is not as frantic and touristy as the tourist ghetto of Thamel or of Kathmandu’s Durbar Square. I remember thinking – maybe I should find a place to stay here while I explore the valley! 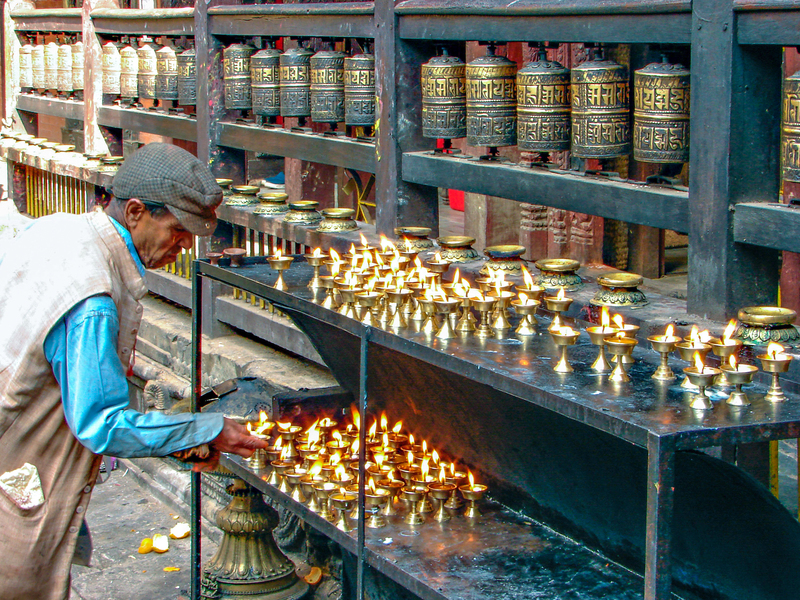 Around the square and down the back alleys are a number of craft shops producing quality metalwork; I would spend some time looking for that perfect Buddha statue after my ramble around Durbar Square. 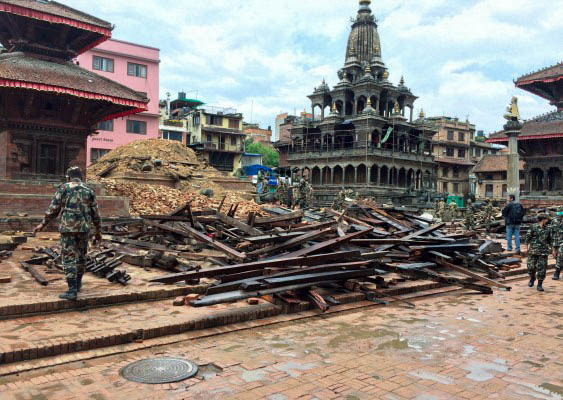 My last visit to Patan was in 2006; yesterday as I looked again at these images I wondered how many of the buildings were still standing after the 2015 earthquakes and aftershocks. 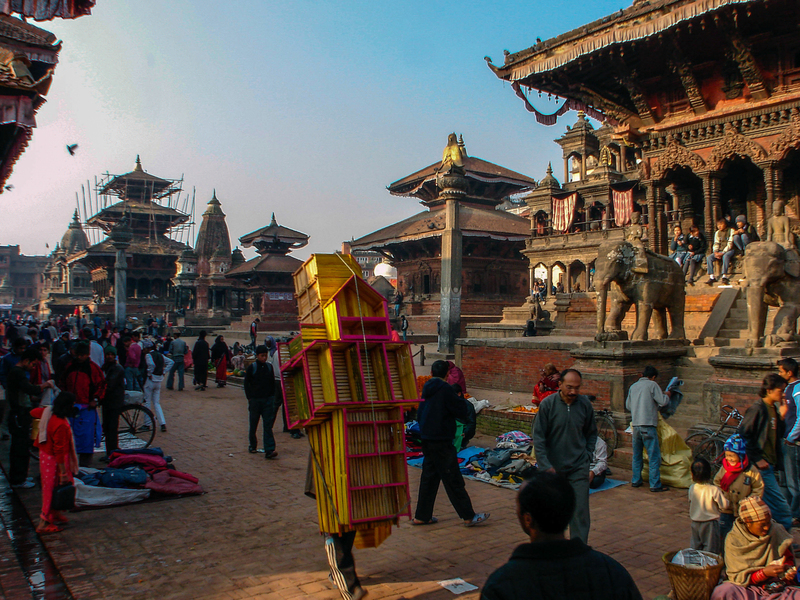 Below is an early morning view from the north end of Lalitpur’s Durbar Square. The Vishwanath (or Vishveshvar) Temple is on the right with its riders on elephants. Built in 1627, the name it was given is one of the epithets of Shiva, that aspect of Brahman representing destruction. How fitting given the recurring earthquakes that have rattled the valley over the centuries and destroyed its buildings! Some of the temples in the above image did not survive the 2015 quakes. To the left of the Vishvanath Temple (or Mandir) is the Krishna Mandir, definitely one of the more exquisite pieces of architecture in the square; it still stands. A column with a golden Garuda figure and the Vishvanath temple at the right of the image complete the scene. Like the Vishvanath to the right, it was built during the rule of Siddhi Narasingh and completed ten years later in 1637. 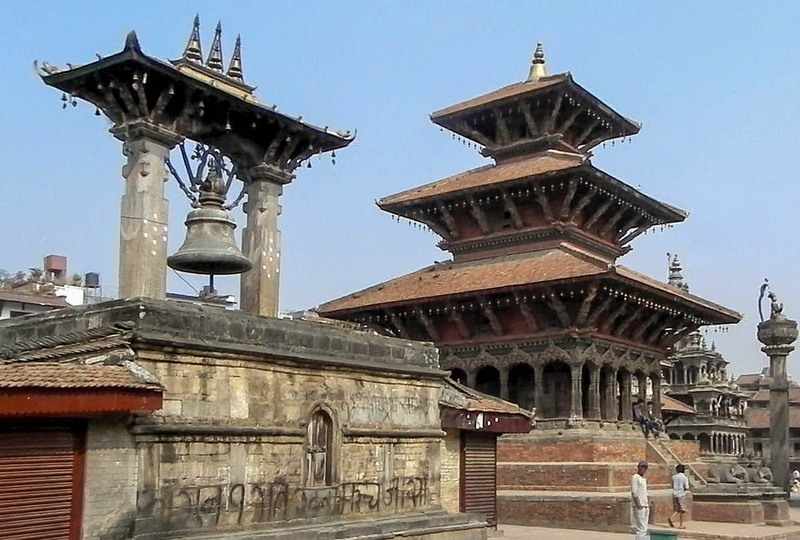 However, the temple on the left of the above image – the Char Narayan (also named Jagan Narayan) with its two stone lions guarding the entrance – was destroyed in the 2015 quakes and other than the plinth nothing remains. Here are two more pre-quake views of the north end of the square. 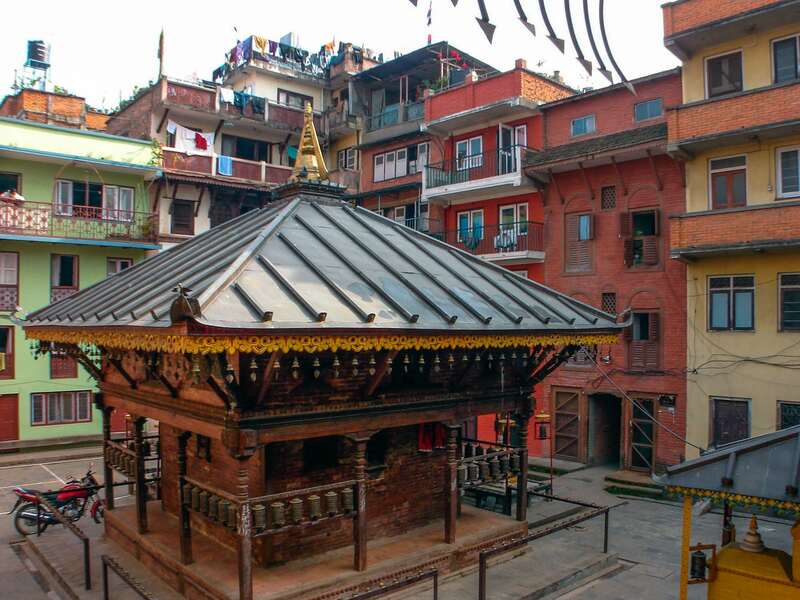 The Char Narayan temple dated back to 1566 and was one of the older temples on the square. See below for a couple of internet-sourced pre- and post-quake images. 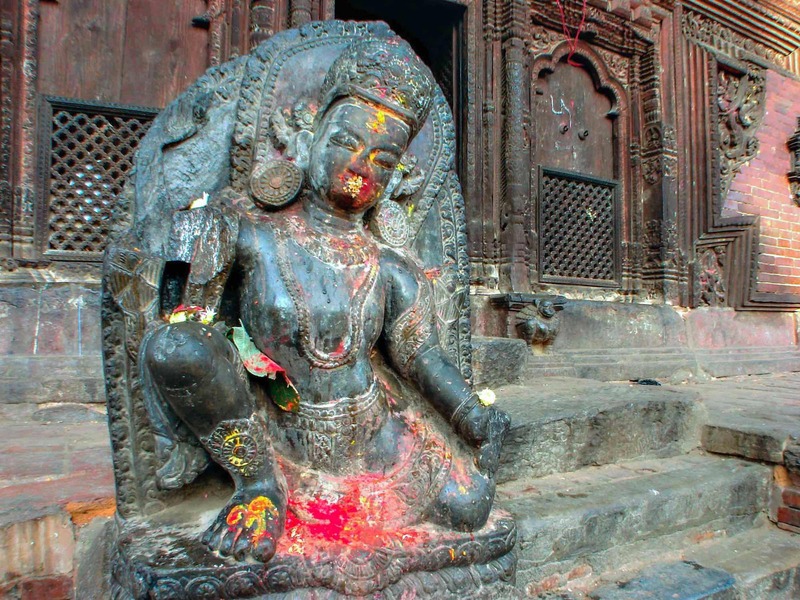 A German group – the South Asian Institute – has initiated a fund-raising project to help rebuild the temple. Their website provides excellent background on the temple’s significance as well as architectural drawings – check it out here. I eventually ended up in a restaurant/café at the south end of the square, mostly chosen because of its third-floor view! As you can see, the square is a fairly compact collection of structures. In the center of the image is the three-story domed Krishna Temple (Chyasin Dewal), the eight-sided shikhara-style mandir. It was erected in 1723. 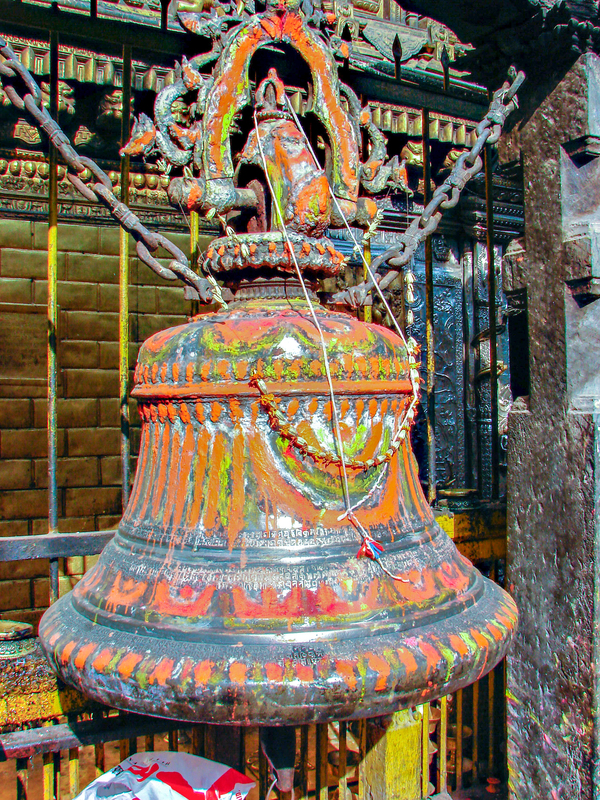 Next to it the Taleju Bell is suspended between two stone pillars on top of a raised platform and to the right of the bell is the three-storeyed Hari (Shiva) Shankar (Vishnu) or Shankar Narayan Mandir erected in 1706. Here is another shot of the Taleju Bell and the Hari Shankar or Shankar Narayan Mandir and an internet-sourced image of the Hari Shankar by itself. 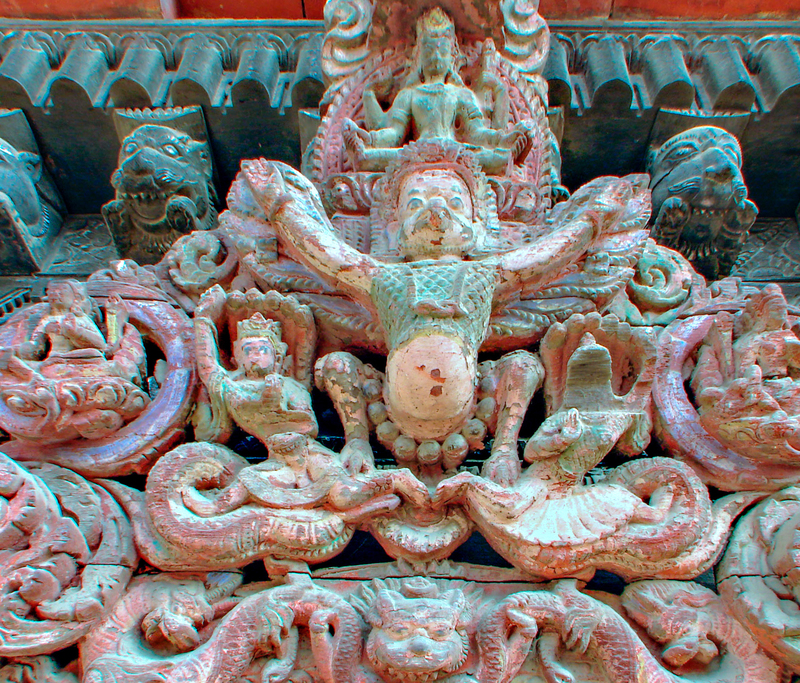 What really stands out is the wooden strut work with the carvings on them. 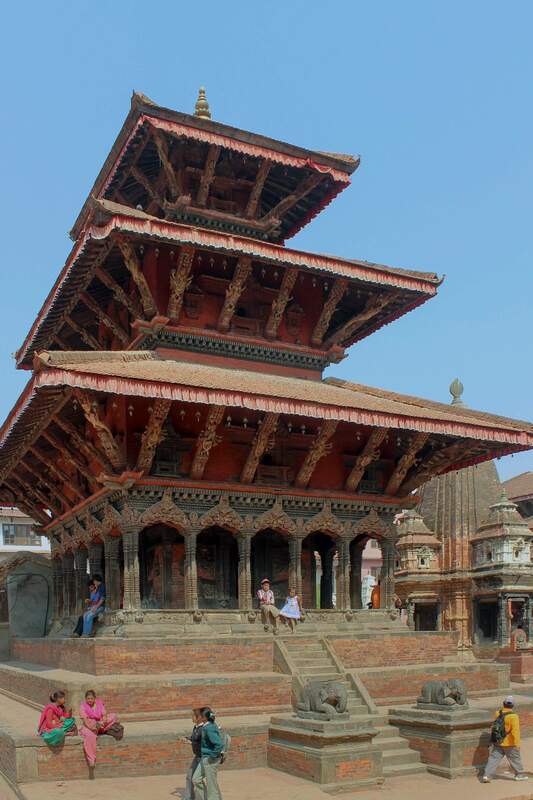 Unfortunately, the Shankar Narayan Mandir did not survive the 2015 quakes. In fact, looking at the drone images below (accessed from Youtube videos) you wonder about the point of visiting at all, both in terms of time that could be spent elsewhere and the unchanged 1000 rupee entrance fee. Perhaps the way to rationalize it is to see it as a donation to a reconstruction that you can see going on very slowly with your own eyes. 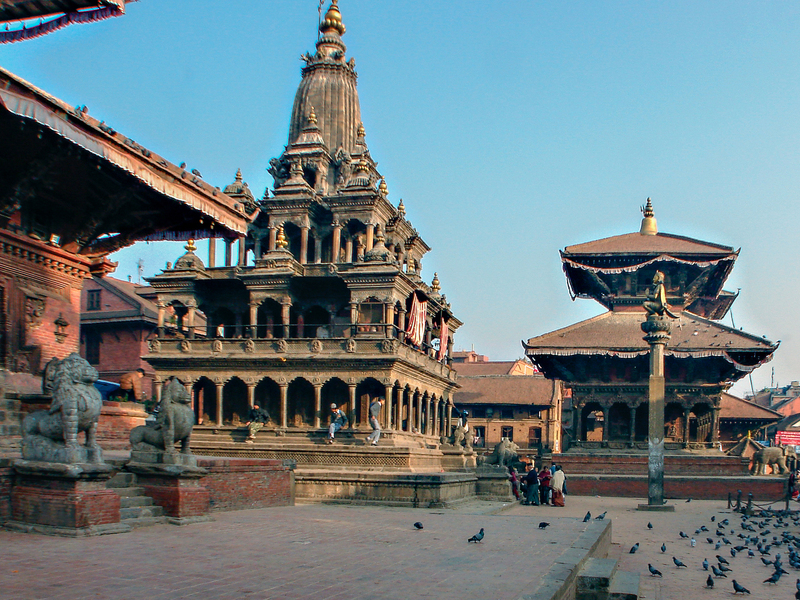 The Patan Durbar Square of my memory – and of my 2006 photos – it will certainly not be. On the east side of the square is the royal palace with its series of chowks. 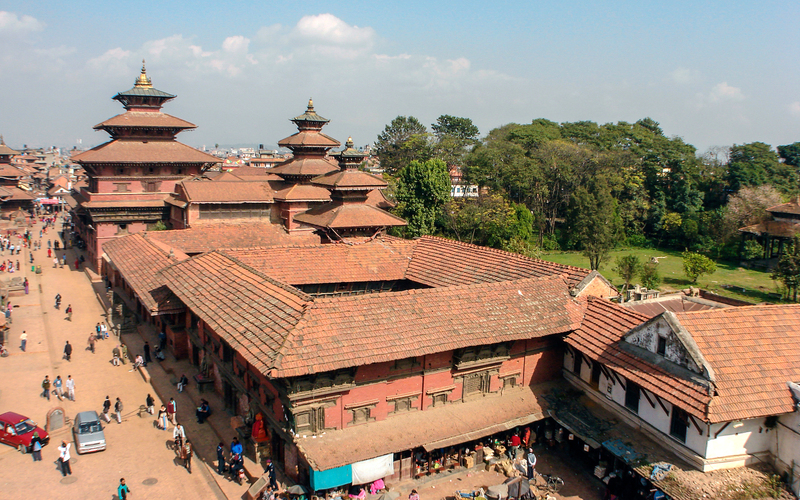 Originally built in the 1300’s, the palace complex pre-dates those in Kathmandu and Bhaktapur. My shot from the patio of the restaurant shows the palace stretching the entire east side of the square. To the north end of the palace complex, you can see the three-storeyed Taleju Mandir and to the right the smaller Degu Taleju and Taleju Bhavani Mandirs. I would later spend some time in the museum, rich especially with fine metalwork sculpture. The following photos come from my ramble through the various lanes and alleys of the town in search of that perfect Buddha statue! 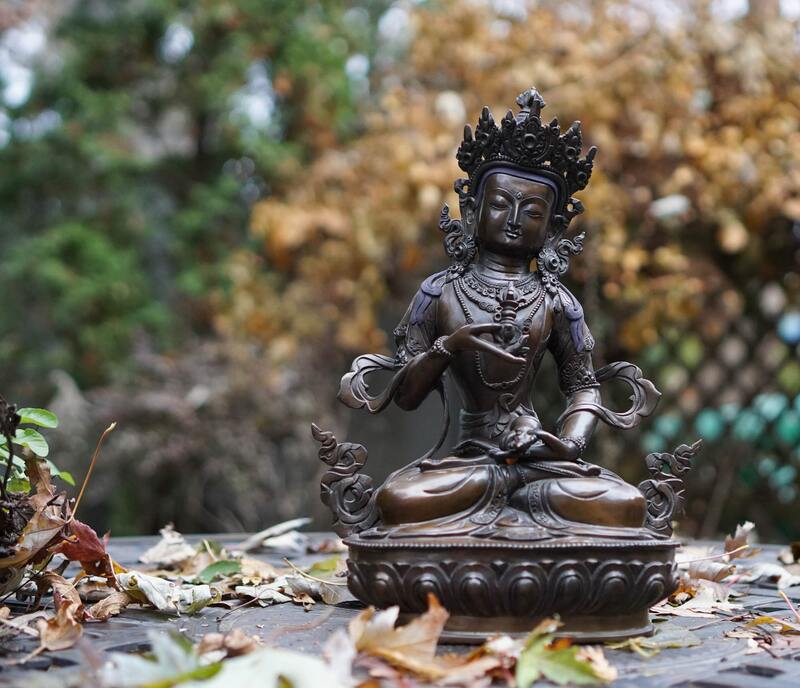 Below is the Vajrasattva figure I ended up buying after some shop-to-shop visits. In retrospect, it is funny to think of the energy I spent on a hunt that seemed so important at the time – a silly obsession that would have had the Buddha rolling his eyes! Combine that with a concern of being over-charged and you have a decidedly un-Buddhist way to spend your time! 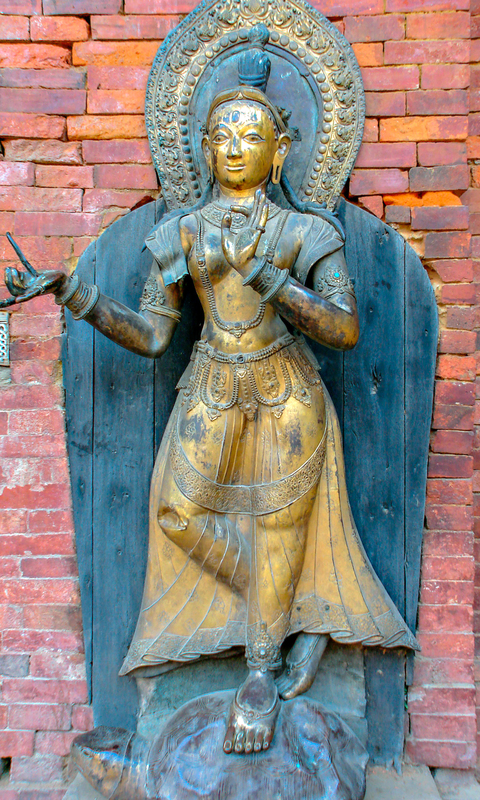 Eventually, I found the Hiranyavarna Mahavihara Newari Buddhist monastery – aka the Golden Temple – on one of the streets away from Durbar Square. It was “shoes off” at the entrance and then down into the courtyard with its large bell. To the side a row of candles and prayer bells. I spent some time in this very atmospheric little temple complex and taking more than a few photos. However, transferring files from one computer to another and a few hard drive crashes over the past eleven years have taken their toll! Where are those jpgs? 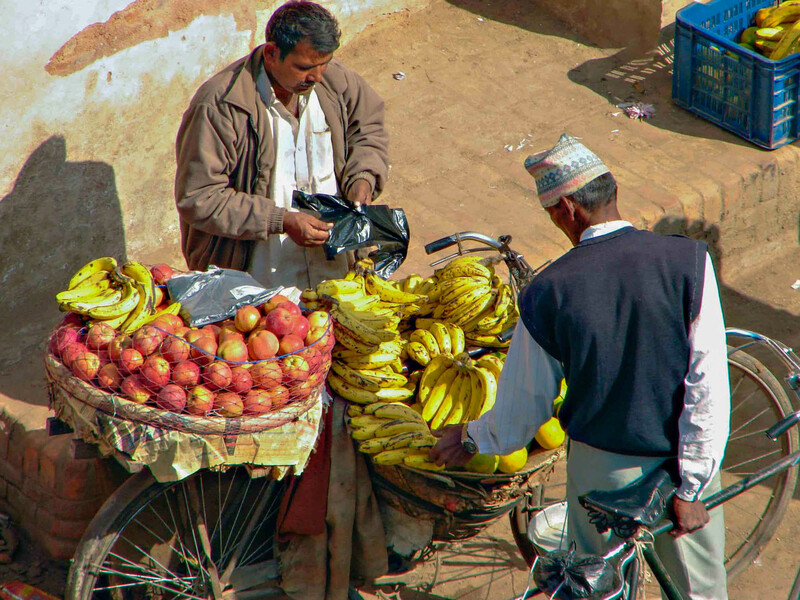 I eventually returned for lunch at the cafe I had been at in mid-morning and watched as the street life whirled by below me. Patan was the last of my Kathmandu valley visits and it may be that I was flagging a bit after four days of temples and stupas. But there is more to see and perhaps next year I will! 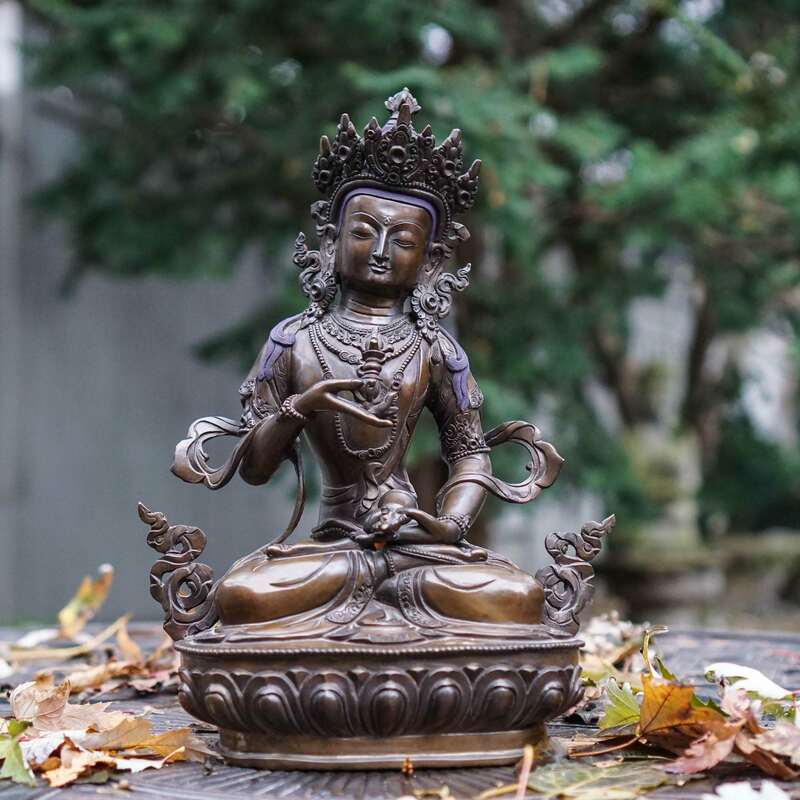 Until then I have my Vajrasattva figure seated on a lotus holding his thunderbolt (Sanskrit vajra or Tibetan dorje ) in his right hand and a bell in his left. I contemplate on the wisdom and compassion he offers and my mind drifts to the impact of the earthquake on the lives of close to two million residents of the Kathmandu valley as well as their cherished temples. I think of the increasingly unbreathable air they have to breathe every day and the inability of the well-fed political class to do anything to improve the lives of the citizens they are supposed to serve. 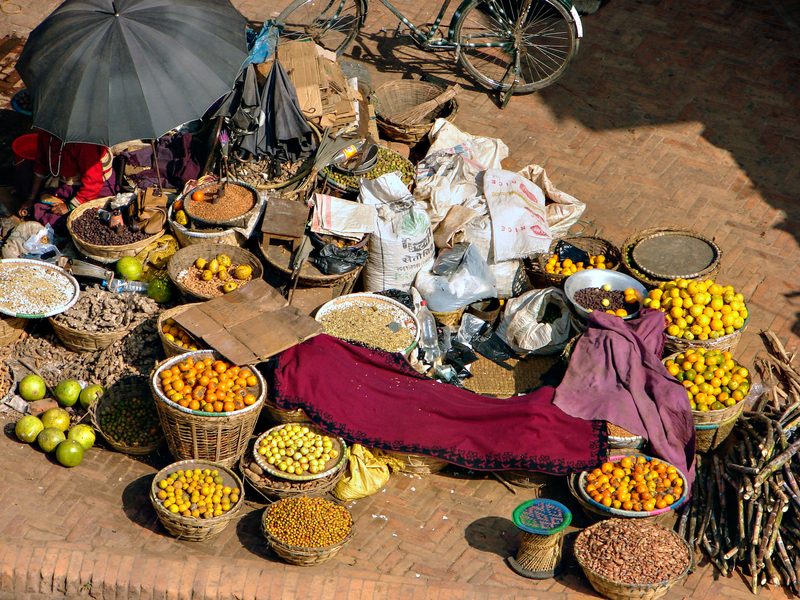 This entry was posted in Easy Travelling, Nepal. Bookmark the permalink.